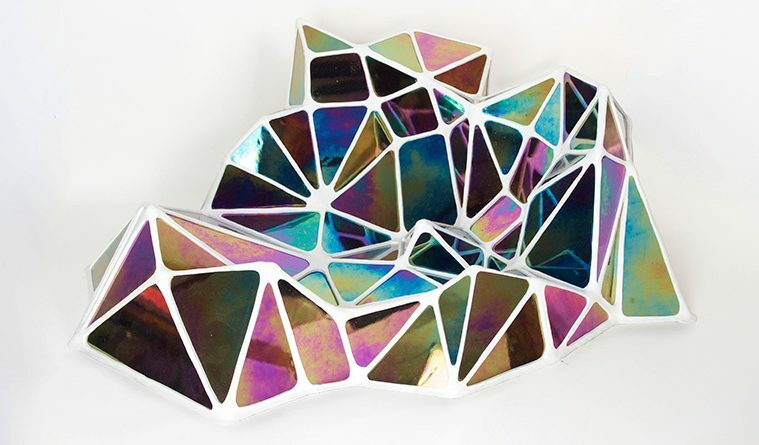 Graham Caldwell, Polychromatic Formation 1, 2011, iridescent glass and epoxy, 28x32x16 inches. 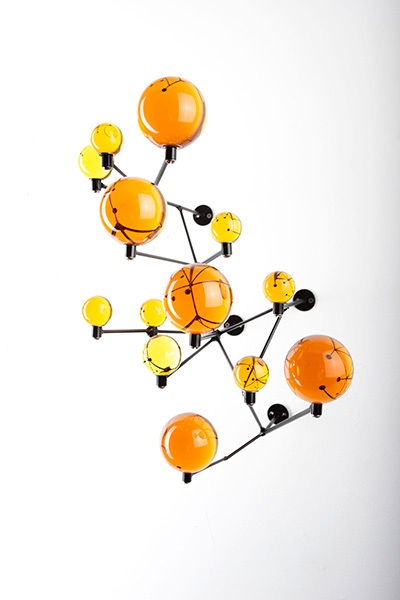 Graham Caldwell, Amber Orbs, 2017, solid glass and steel, 20x14x16 inches. Brooklyn-based artist Graham Caldwell’s exhibition Glimpsed Through Liquid, his first at Circuit12 Contemporary in Dallas’ design district, fills the space with serial glass sculptures, spanning nearly two decades. Caldwell creates individual works from a template and proceeds to sculpt glass into endless variations on a single motif. Glimpse Through Liquid, on view through Oct 7, introduces Dallas to the artist’s blend of sculpture, craft, and design. 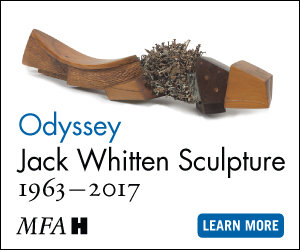 The exhibition features works from four of Caldwell’s sculpture series. There are mosaics, made of iridescent glass triangles that form geometrical reliefs; glass-orb-constellations, suspended from the wall by metal armatures; mirror boxes, and illuminated boxes. By applying elemental shapes and employing repetition, Caldwell attempts to reign in and control the amorphous, undefined and unbounded character of these motifs, creating a structure in which to ground the works. His use of repetition also succeeds in creating a sense of rhythm. In each glass ball of the orb-constellations, the sculpture is refracted, creating an interplay of lines formed by the black armatures. The iridescent glass mosaics are intricately constructed bas-reliefs reminiscent of abstracted and tessellated mountain landscapes, and the geometric patterns give the works a strong cadence. The refractions of the orbs and the reflection of light on the iridescent glass of the mosaics give the sculptures dynamism as light, colors, and shapes shift at every angle. 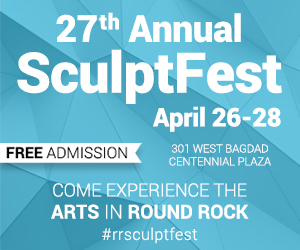 The rigid template Caldwell utilizes for his sculptures, as well as a pallet of basic shapes, ground the patterns and structure otherwise indeterminate forms of his free flowing motifs. Yet even with such rigid parameters, the works lack a distinctive shape and appear to meander as if elements were added somewhat arbitrarily until a certain balance was reached. Therefore, the sculptures read as indistinguishable and interchangeable, and the motifs of the mosaics and orb-constellations are endless, but the resulting pieces are restrained and confined. I was left to question why the artist constrained the mosaics within basic rectangular shapes. Contrary to the complexity of the mosaics and orb-constellations, Caldwell’s box sculptures series are seemingly straightforward glass square boxes. Some are constructed from mirror-glass, giving the appearance of having been left too close to the furnace—the face of each is partially molten from heat, which gives them a crumpled up, bent, or draped appearance. His free-standing glass-boxes, or “illuminated boxes,” are made with dichroic film which changes color depending on the angle of light. Inside each of these colored glass boxes is a nondescript glass object that looks as if it is growing up from the bottom. The illuminated boxes and the molten mirrors are limited by the shape of the box itself. When seen as individual works, each of Caldwell’s sculptures looks like more of the same, and they are difficult to distinguish or decipher from one another. When considered as part of a larger sculpture series—some of which Caldwell has been working on for almost two decades— I was left wanting more information about the conceptual underpinnings for his execution decisions. For example, the construction of the pieces is clunky, the washers and screws under the orbs’ armatures are visible, and the epoxy holding the mosaics together is thick and pasty. These aspects add visual weight to forms that I would otherwise expect to be light and energetic. Arie Bouman is a writer living and working in Dallas. He attended the School of Visual Arts, earning an MA in Critical Theory and the Arts and was awarded a two-year residency at the Rijksakademie voor Beeldende Kunst in Amsterdam.